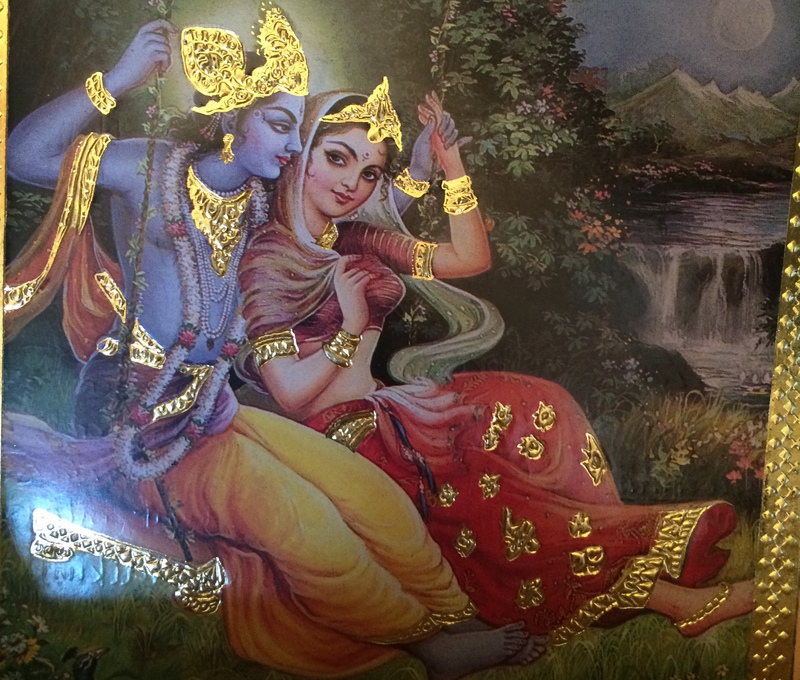 Question: Did Radharani marry someone else, or are they simply engaged? She is married to Abhimanyu (lit. the “Proud One” or the “Supposed Husband”). Her sister-in-law is Kuṭila (lit. “Crooked”, “Fradulent”, “Dishonest”). Her mother-in-law is Jaṭila (lit. “Hairy”, “Twisted”, “Problematic”). The marriage is an abhiman (the husband is Abhimanyu). Abhiman means “an idea.” In the realm of pure consciousness, ideas are immediate realities – so saying that the marriage is an abhiman doesn’t mean that she isn’t really married. She is “really” married, but the reality is that this marriage is a ruse. It is simply a prop to make her relationship with Krishna so much more thrilling, primal, desparate, and passionate. In the realm of pure consciousness, ideas are immediate realities – so saying that the marriage is an abhiman doesn’t mean that she isn’t really married. Question: Did her marriage to Abhimanyu happen during the period when Brahma kidnapped the cowherd boys? Maybe. But this doesn’t change the fact that they wedded people other than Krishna. It does, however, very nicely illustrate that even these people who are “other than Krishna” are actually manifestations of Krishna’s śakti and therefore, in a philosophical sense, are not different than Krishna. It is very important to understand that the gopīs are married to other men. Ordinary people think this is a scandalous flaw, but these people can only comprehend conventional morality (dharma) and have no concept of ānanda (bliss) and prema (pure love). Most people love God because he is God. They love him because it is right and proper. This is wonderful but lacks the intensity and passion of Vraja-prema. Outside of Vrindavana, there is always some trace of how proper and right it is to love Krishna. Outside of Vrindavana, there is always some trace of how proper and right it is to love Krishna. Even Krishna’s Queens in Dvārakā have some trace of this, and thus their prema lacks the incredibly intense passion that only the gopīs of Vraja have. The gopīs love for Krishna is so passionate that it actually manifests an environment in which they have to break conventional morality. Not only is their love not motivated by something extraneous (like morality), it actually shatters everything extraneous. Their love for Krishna goes against what is good for them in a conventional sense, and what is moral in a conventional sense. Ordinary people don’t understand this, therefore it is kept hidden for billions of years, and only occasionally revealed by Srimad Bhagavatam in the kali-yuga where Sri Krishna Caitanya comes to clarify it. The gopīs love for Krishna does not factually break any moral principle, because they are Krishna’s śakti and therefore his eternal consorts / wives. But the intensity of their love manifests an environment where the abhiman (mood / idea) is that they have to break their moral principles and potentially ruin their lives for the sake of Krishna. This allows the highest, purest, most passionate love to manifest. This enables the supreme ānanda – premānanda. It is called rāgātmikā prema and it is found only in Vraja, Vrindavana. In Vraja it is found most fully among the gopīs (where it is known as kāmarūpa-rāgātmika prema – “a divine love which epitomizes passion to the point of resembling lust”). Question: Did Krishna meet Radharani again after leaving Vraj? Is that connected to Ratha yatra? He does not leave Vraja. This is another abhiman. But, as the abhiman plays out, he returns to his royal birth-family in Mathura and soon thereafter relocates accross the subcontinent to Dvārakā. There is an incident where there was an eclipse and the two (Radha and Krishna) went to the same place at the same time (Kurukṣetra) to perform ceremonies pertaining to the eclipse. But this person called Krishna at Kurukṣetra is not exactly the same Krishna who is in Vraja and never leaves. Outside of Vraja, this person named “Krishna” carries a sense of majesty and royalty, and thus there is a lack of the intimacy that exists in Vrindavana. So none of the Vraja-bāsī, none of the gopīs, felt they were really seeing Krishna there. They therefore wanted to pull his charriot forcefully back with them to Vrindavana, where he could manifest his true self tangibly once again. For Sri Krishna Caitanya and his followers, Ratha Yatra is a dramatic enactment of that mood: pulling the cart from the royal city-like mandir to the rural vraja-like Gundica. Question: Is Srimati ji older than the Lord? What makes it complex is that exalted souls mature more quickly than normal people. Krishna and the gopīs mature at 150% the normal rate. Sometimes their age is described via their actual maturity level. Sometimes it is decribed via chronology. And sometimes these are mismatched. For example, by Chronology Krishna was 11-12 when he left Vraja, but by maturity he was 16-18. According to Sri Krishna Caitanya’s beloved Sri Rupa Goswami, whom I accept as the most knowledgable about these things, Srimati Radharani is “āpañca-daśa-varṣam” – fifteen years old, which he describes as “vaya-kaiśorikojjvala” – the most splendedly romantic age. So, in my opinion she is only very slightly younger than Sri Krishna. Question: Which is the age she was married? I am not sure. It would be as conventional for the culture of that time (the time during which they manifest their līlā on our plane). Probably at around 12 or 13. Approaching Krishna śakti with a spirit that she is our mother will direct us to a manifestation of Krishna śakti more suitable for reciprocating our specific affection – possibly a queen of Dvārakā – an example of Krishna’s hlādinī śakti in a manifest form that includes motherhood. To take Srimati Radharani as our mother may be reasonable in some sense. There is vatsala rati (parental affection) mixed in sakhya-rati (friendly affection) when the friends are slightly inferior/superior to one another. So when Srimati is seen as our superior, protective friend, there is some legitimate sense of motherliness in that. But even there, the predominant mood is friendship and companionship with Sri Radha. The vatsala-rati is an adjunct to that. Sri Radha does not have any children, but she has billions and billions of very confidential and intimate friends, so to manifest within Vraja in connection with Sri Radha, it is probably better to approach her as a friend rather than a mother. I believe that what you identify as feeling her as your “mother” may very well be the seed which blossoms into feeling that Srimati Radharani is your most special, sacred, well-wishing friend. Previous According to the Veda, Are Women Less Intelligent than Men? They were married off when they did not have any sense of worldly affairs. So their marriage was not in their control. Would they have accepted to marry someone else at their kishor avastha? Try telling that to a teenager that you need to get them married to someone not of their choice. As per Gopala Campu of Srila Jiva Gosvami, Krishna does indeed get married to the gopies at the end of Krishna’s bhauma lila before they ascend to Goloka. IMHO, (and begging aparadh kshama from Srila Vishvanath Chakravarti Thakura) however exalted Parakiya bhava may be, it cannot be the end goal, since it entails separation, and separation is a means, not the end. The end goal is always union. This is the gist of Jiva Gosvami’s argument. The goal is not Union, the goal is happiness / ānanda. The correct balance of Union and separation is essential for dynamic maximization of ānanda. AFAIK, according to Jiva Goswami, the goal is indeed union, and separation is a means. And without the “fairy tale” ending, that ananda will never find fulfilment. Yes this has been refuted by Vishvanath Cakravarti Thakur, but I find Jiva Gosvami’s arguments more convincing, giving precedence to the desires of the actors than to any philosophical conclusion. Besides Jiva Gosvami has throughly explained that the “excitement of love” is not in its being illicit, but in its “difficulty of achieving union”. Ashe give some consideration to the concept of sambhogaeccha and tattadbhaveccha. Consider also some of the shastras on romance and so on. Union is certainly the goal as it produces great ānanda but without vioralambha the union is not dynamic and ever fresh. I will leave it at that. You are entitled to the understanding you have, certainly. I don’t wish to appear argumentative. I am not denying the role of separation. Only that as I had suspected, and as Sri Jiva says, separation cannot be the goal of our efforts. Separation is arranged by providence, or Yogamaya, to add spice, but it cannot be a desire of a devotee “I want to achieve separation.” That is why it is highly suspect that the gopis would desire “I want an illicit relationship eternally.” And if the desire is that of union, it has to be fulfilled finally – so marriage is inevitable. The semblance of the illicit relationship is not present in Goloka, only on earth. Well that is Jiva Gosvami’s view and not accepted by contemporary orthodoxy. But I find it more fulfilling. I agree separation is not the goal, but the goal is not exalted without it. There is separation and Union in parakiya bhava and in svakiya bhava so I don’t find a valid analogue in your comparison of Union to svakiya and separation to parakiya. Your view that gopis are not married to other men is not supported by kaviraja Goswāmī, jayadeva, bilvamangala and so on. Your claim that it is the view of Śrī jīva therefore seems doubtful. The union in parakiya will not provide fullness – samriddhi. It is always corrupted by a sense of some sort of inadequacy. This is just one of the arguments and Jiva Gosvami provides pages upon pages of them refuting not just existing opposing points of view but anticipating future objections as well. The consciousness of being married to another man is present only in bhauma lila and the lila always ends with the gopis getting married to Krishna. In Goloka, Krishna and gopis are eternally married. Jiva Goswami has extensively written about his opinion in his commentary to Ujjval Nilamani, in Gopal Campu, Priti Sandarbha, and his numerous other works.